Pack Trip: A very special riding tour inside Tsylos Provincial Park, British Columbia. The park underlies very strict environmental rules making it a perfect setting for a wilderness trail-ride deep into the backcountry away from all civilization. The ‘Goat Camp Valley’ is rugged, wild and absolutely beautiful - home of the mighty Mountain Goat. The photo opportunities are some of the best in the world, amidst rugged glaciers, mountain meadows, alpine flowers, crystal clear lakes and streams, and wildlife. The vistas and settings are too beautiful to put into words. Or you may explore the "Wild Potato Range" with breathtaking green alpine valleys, lakes and canyons. Chilko Explorer: This trip was designed for the intermediate to advanced rider looking for an exciting riding adventure in breathtaking country while enjoying the comforts of a wilderness lodge at night. After an exhilarating day in the outdoors you can play volleyball or horse-shoes, relax in the whirlpool on the front porch overlooking the Chilko Valley; or just relax in front of the large wood-burning fireplace exchanging stories with your fellow riders. Exceptional meals and fine wines are served family style. One day during the week you will take part in a float trip down Chilko River or sightseeing boat ride up Chilko Lake. Rates include*: Accommodations: 2 nights camping at the lodge, 5 nights wilderness camping, 7 nights in log cabins or rooms in lodge, all meals, wine with dinner at lodge, 13 riding days, 1 day lake trip by boat for hiking and sightseeing, use of canoes and kayaks, tent, sleep pad, duffel bag, saddle bags. Single supplement for lodge part only. The Wild Potato Mountains offer a multitude of different kind of scenery and riding styles: Ride through high alpine plateaus, hidden valleys, deep mountain passes, and open sandy beaches. Enjoy the splendid views, the immense variety of wildflowers, ancient fossil beds, and the companionship of your fellow riders. The First Nation's Legend says that a woman once traveled across this range of mountains planting wild potatoes, thus the name "Potato Range". This circular trip combines the spectacular beauty of the Coast Range Mountains as well as the faster riding of the Chilcotin Plateau. Our explorations will take us from one spectacular campsite to another. Each camp is nestled adjacent to a pristine lake. We change camps all but one day. The riding speed is primarily at a walk until the last two days where we will do some trotting and cantering. On the last two days we drop down to the Tatlayoko Valley, and the camp is met by the truck. The truck transports the camp so we are able to canter the last couple of days of the trip. This is a beautiful trip, with amazing vistas and blankets of wildflowers! A day for rest and relaxation. Afternoon ride. We travel along the shores of Chilko Lake , before we climb up to our Goat Camp base at 6,500 feet. Rugged peaks surround the valley and tower at about 10,000 feet. From the base camp we spend the next few days exploring the awesome and rugged beauty of Goat Camp. This trip offers plenty of time to relax, hike, photograph wildflowers, and wildlife. Mountain Goat, Mule Deer, Bear, and Mountain Marmots make their home here. Goat Camp is one of the most beautiful places on the planet. After exploring by horseback the many mountain peaks and valleys, you return to base camp in time to enjoy a glass of wine, watch the stars come out over the valley, and listen to the tinkling of the horse bells as the munch happily in this spectacular mountain valley. The majority of the trip is walking, due to the terrain except the last day back to the Lodge where there is some trotting and cantering!! The majority of the trip is walking, due to the terrain and the packhorses, except the last day back to the Lodge where there is some trotting and cantering! Pace: Slow with steep slopes. 4-6 hours in the saddle per day. The pack trip has very limited or no vehicle support. All equipment and food will be transported by pack horses, so pack light! Weight restriction for your luggage is 35lbs. Please pack in soft-sided luggage. Tents, sleep pads, duffel bags, and saddle bags are provided. Extra items can be left at the lodge during your ride. This is a combination of our Chilko Explorer and Chilko Pack Trip tours so 7 nights will be spent in the lodge, 2 nights camping outside the lodge, and 5 nights camping in the wilderness. On the first and last night of this week long trip you are accommodated at the lodge, either in one of our cabins, or if not available, in our very comfortable tent camp near the lodge. For this portion of the trip you will be staying at our Lodge and returning back home to a wonderful evening meal, cold drinks, time by the fireplace and a relaxing hot tub under the stars. 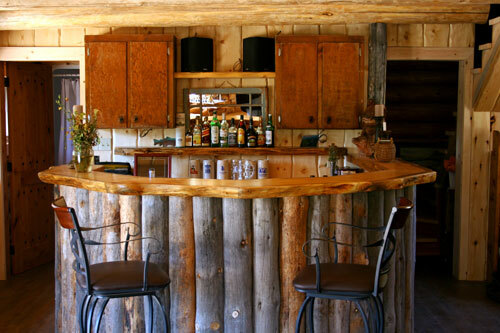 The wilderness log lodge provides a warm and welcoming gathering place to enjoy good times with your fellow travelers. Situated adjacent to the Chilko River, the location of the lodge and guest cabins all take advantage of offering you beautiful views of the river, valley, and the Coast Mountains. The lodge hosts the dining area, the great room with a big stone fireplace, a fully stocked bar of beer, wine, and spirits, Jacuzzi, barbecue area and big decks. The lodge is a great place to share a drink, play a great game of cards, soak in the Jacuzzi overlooking the river, or take advantage of the big deck while viewing millions of stars. Of course an option is to sit by the roaring fire sharing a great story of the day. Canoes and kayaks are also available for use. Please note there is no cell phone reception or WIFI. We have 3 log cabins and 4 rooms in the lodge to accommodate up to 16 guests (a mix of riders, fly fishers, or bear viewers). Each unit is set up for two people and offers private bathrooms, comfortable beds with Egyptian cotton sheets and duvets, gas fireplaces, or a wood burning stove. The accommodations are very comfortable. There is daily maid service to ensure that your room or cabin is kept comfortable for your stay at the lodge. We have a laundry machine available and clothesline at the lodge, which can be used in the evening- otherwise the cabin attendant can do laundry for a small fee. Single supplement will include a private room but may have a shared bathroom with the same gender during the lodging week. All meals are included in this trip from lunch on Day 1 to breakfast on your last day. Our campfire gourmet meals are prepared over an open fire and are delicious and plentiful. The morning’s meal is a hearty Canadian breakfast of bacon, sausage, eggs, pancakes, eggs benedict, or our famous Chilko scramble, all cooked over a camp fire. Lunch is packed in your saddle bags and is made up of sandwiches along with an apple or orange and a candy bar. Dinner is a fresh salad, vegetable, meat, pasta, rice or potato. Everything is packed with us on our steady pack horses. We also take a mini bar which is chosen prior to leaving the lodge. It is beautiful to get to camp after a gorgeous ride for the day, get your home away from home set up, the horses staked out, and enjoy a glass of wine while dinner sizzles over the campfire. Life at the lodge is focused around the great outdoors. The gathering of everyone for meals is a special time of the day. We serve all meals at the lodge "family style."